Dress yourself in the finest extravagance of an antique era when you wear the Elegant Velvet Dress with Train. 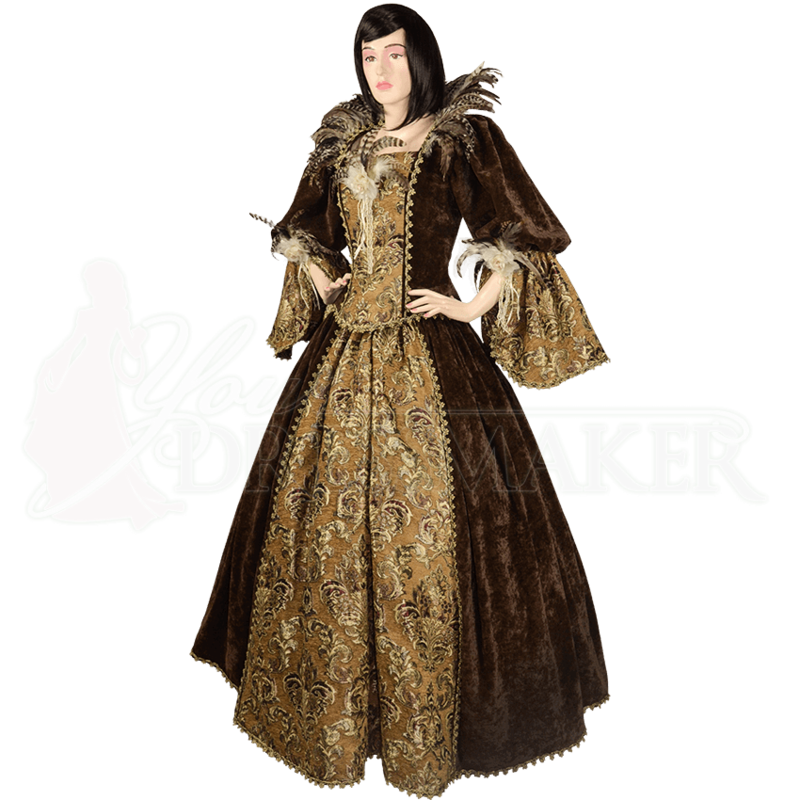 This handcrafted ball gown features Victorian and Renaissance influencing in its decadent velvet and brocade design. Actually two pieces, this dress consists of a perfectly matched top and skirt. Brown antique velvet, lush and smooth, forms the body of both pieces, and the front accent panels are made of gold brocade with an ornate pattern. Striped brown and white feathers form a high-standing back collar and embellish the cream faux flower situated at the center of the bust underneath the square neckline. Puffed sleeves of antique velvet end at the elbows, giving way to exaggerated, elegantly draped cuffs of brocade. Adjust the fit with the lacing down the back. The long skirt has a central panel of brocade surrounded by the antique velvet, and extra length in the back forms a moderate train. Golden ribbons outline hems and panels for an added note of regality. Wear this Baroque-inspired ball gown with our Hoop Skirt (MCI-146), sold separately, to give the skirt the full shape shown here.